Tucson Poetry Festival: celebrating poetry since 1981. Like us on Facebook for upcoming updates on the 2019 Tucson Poetry Festival, Thursday April 25th–Sunday April 28th. Check back soon for further details! 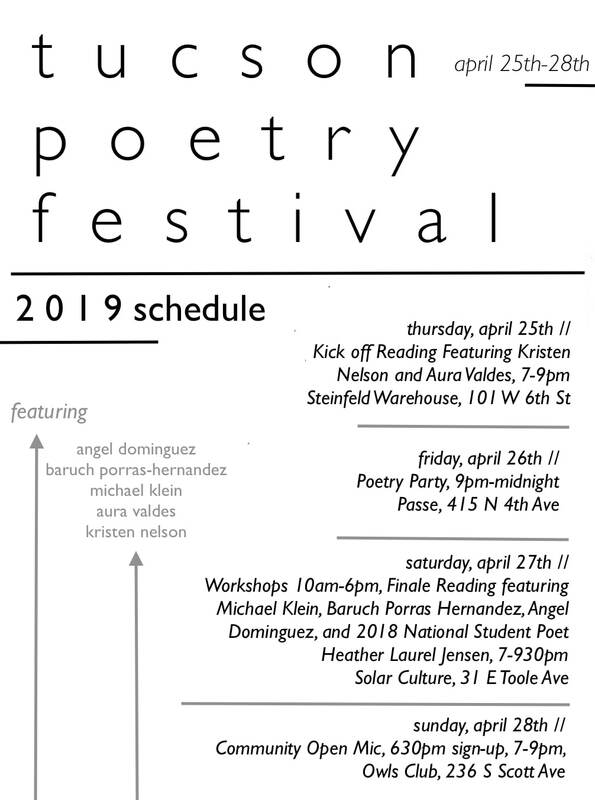 As the longest running event of its kind in Arizona, the Tucson Poetry Festival (TPF) was founded in 1981 with the mission to celebrate, and expand the audience for, contemporary poetry. By inviting poets who represent the diverse and eclectic writing approaches of poetry today to read from their work, TPF has provided people with the opportunity to hear over 150 superb visiting poets in this unique annual experiences. These voices represent some of the most celebrated poets of our time – Jimmy Santiago Baca, Robert Bly, Anna Castillo, Wanda Coleman, Russell Edson, Allen Ginsberg, Sam Hamill, Carolyn Kizer, Maxine Kumin, Sharon Olds, Alberto Rios, Sonia Sanchez, David Shapiro, Gary Snyder, and most recently Claudia Rankine. To celebrate and expand the audience for contemporary poetry through variety of literary arts events, including poetry readings, performances, contests, discussions, and more. To collaborate with the Tucson community to reach new constituencies with other artists, patrons of the arts, organizations, and venues by strengthening our ties in the community, nurturing emerging artists, and supporting established artists.